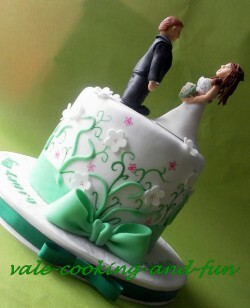 For many wedding cakes it is the topper that makes the cake. Since the topper generally represents the bride and groom themselves in some way they can be the most important part of the cake. 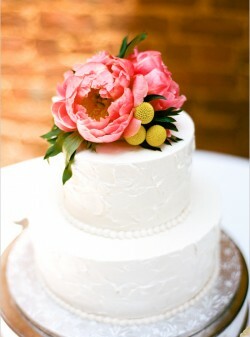 These cakes have unusual, beautiful or simply novel toppers that are worth checking out. What do you do when you’re having a small wedding, or if you’re eloping? Do you forego the cake altogether? Well, you don’t have to. I have a secret. For months I have avoided photos of perfectly good cakes for one reason. 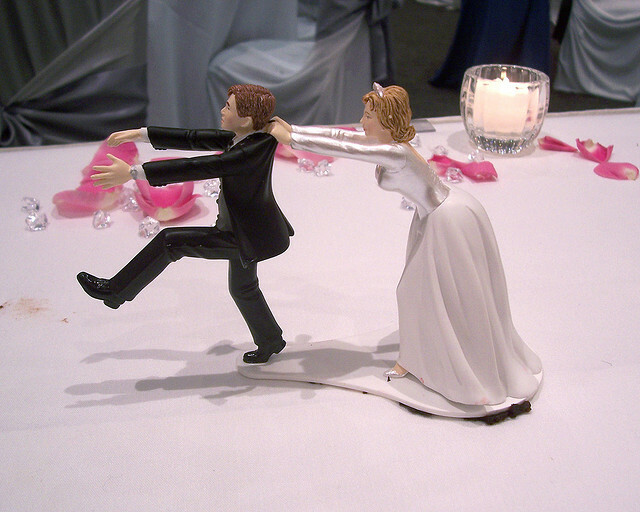 Because they have a Runaway Groom Cake Topper. I really am not a fan of these. I’ve been keeping it in for months and decided to finally talk about this today. Because after all it just is a cake topper. It is actually meant to be a joke. I assume that if a bride felt that she really needed to drag her man down the aisle she probably wouldn’t be marrying him. Right? Or, do I put too much faith in society? To me this isn’t funny. I guess I just don’t get it. Why would people want this on their cake? I had a friend who dated her boyfriend for ten years. Yes, ten. Sure by the time they finally walked down the aisle we made many jokes about how long it took and at the rehearsal dinner we all said the word finally about six hundred times. However, if she had put this on her cake I would probably think it was a little bit sad. Maybe my view is tainted because the only woman I’ve ever seen put this on her wedding cake (in real life) was actually a girl who literally had to convince her husband to marry her. He’s miserable today. Maybe now that I’ve gotten this off my chest I’ll be able to post those gorgeous cakes that I see with this topper on it instead of groaning. Loudly. I’m not trying to be Negative Nancy or the end all be all of Wedding Cake Toppers. It’s a personal choice and I say if you love this topper and you think it’s hilarious by all means get your Runaway Groom on girlfriend! But please tell me why. Are you with me? Do you think this topper is kind of obnoxious? Or do you love it and think it’s the funniest thing you’ve ever seen. I’m writing to you from the wild, wonderful mountains of West Virginia. We’re up for our annual fall visit, to see the leaves, to eat favorite foods, to hug the necks of people we love. Sadly, a wild, wonderful wind came through the night we got here after an ungodly long drive. So the pretty leaves are all on the ground. But we will try and soak up some fall, and delight in our surroundings. It really is nice to wear a sweater and not get hot. 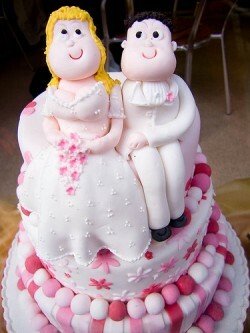 Last May I kind of fell in love with Star House Designs when I featured their Bicycle for Two Cake Topper. That love was solidified today when I came across this adorable Rainbow and Little Tweet Cake Topper. Cake Topper Thursday: Cake Poms! 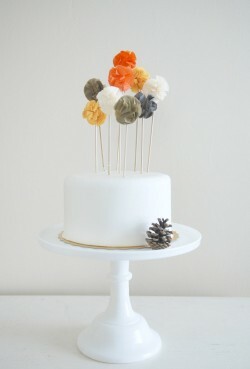 Cake Poms make me happy. For real. SERIOUSLY. Where did the year go and how is it October?? I know that’s goofily unoriginal. But when I typed that title just now, I was all, like…whoa. And I’m not a like whoa kinda girl. It always amazes me what cake artists can do with a little gumpaste. Seriously. Have you ever seen that stuff before it’s carved and molded into something like this? It’s not exactly the easiest substance to work with. How it goes from a lump of white stuff to this I’ll never know. I guess that’s why I just write about cakes instead of making them. Raise your hands and shout “yahhh” if you’ve got a thing for Martha Stewart. Let’s face it. There is only ONE Martha Stewart and I loves her. I seriously don’t think I’ve ever met anyone that said they hate Martha Stewart–well maybe people who know her personally–but like her stuff and her style…I just don’t think anyone can hate her. If you hate Martha Stewart style you probably kick puppies. Or, you don’t…whatever. My point? I do have one. 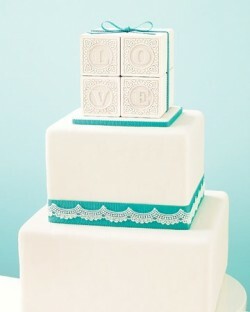 I fell head over heals for this L-O-V-E Block Cake Topper that was found on Martha Stewart Weddings. The topper consists of four blocks spelling out the word love. 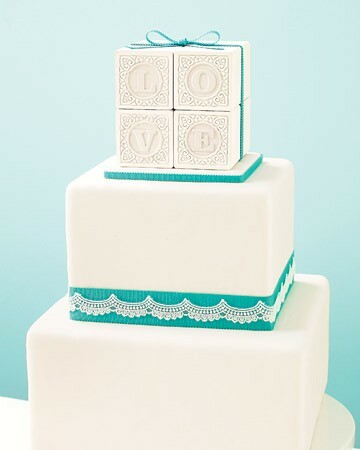 My favorite part is the gorgeous teal bow that is wrapped around the boxes that coordinates with the fondant stripes around the base. On a somewhat random note I used to have a silver piggy bank that looked just like this topper. Anyone else…or was that just me? What do you think? Do you share a love for Martha or are you not such a fan? Do you think it’s weird she used to date David Letterman? That’s a couple I can’t see together. Oh well…too bad it didn’t work out. They would have had a gorgeous cake. Yes…I know it’s technically not fall. And I know it’s literally still in the 80s and 90s oh…everywhere, prettymuch. But, you see, I can’t help myself. There are two things I love (well, there are many things I love…but the “two things” work here, so we’ll call it poetic license.) I love fall. And I love Disney. So you can imagine how hard I flipped when I saw this ab fab cake topper on Etsy! 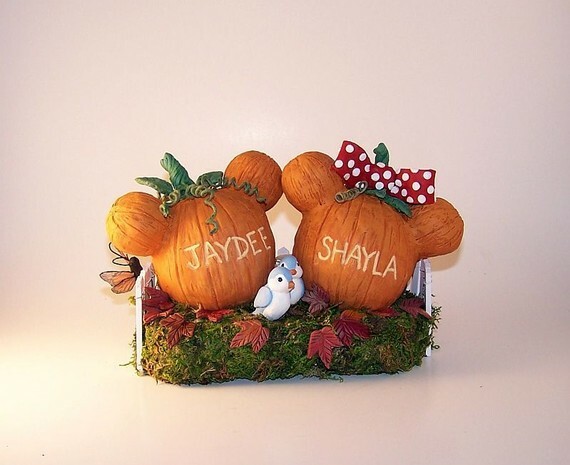 Sweet Pixie Pie will customize your very own Mickey and Minnie Pumpkins for the top of your adorable fall wedding cake! Yes, dreams really do come true! The toppers are custom-made (obviously) from polymer clay. 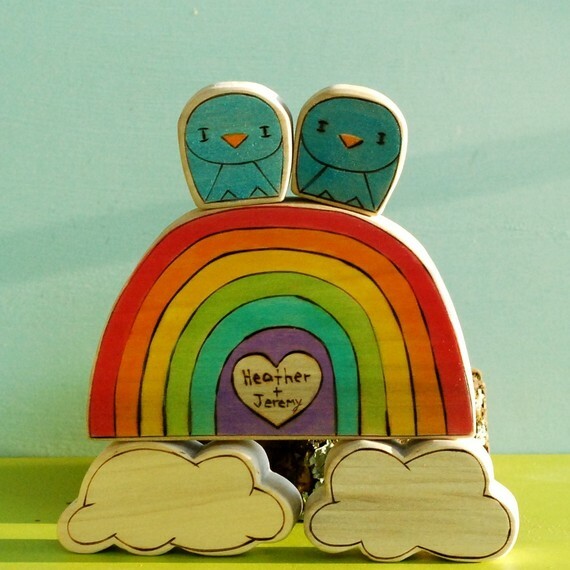 Clearly, this adorable topper is destined to become a keepsake long after the “I dos” are done. Check out Sweet Pixie Pie’s Etsy shop for more deets! And Happy Early Fall, y’all! Lately, though, most of the monograms have been in the form of a placard on the side of the cake – a classic detail that I fall in love with all over again everytime I see it. 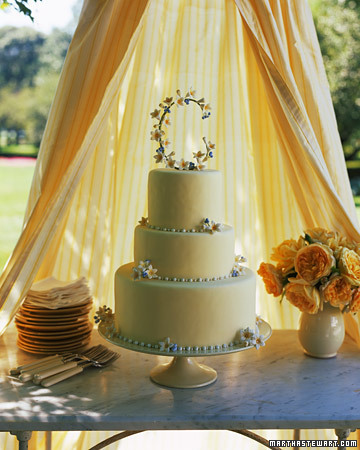 Another option – the swooshy rhinestone jobby on the top of the cake. Sparkles and pretty. Perfection.